Sunderland Pink Lustre Tea Service from the collections of the Worthington Historical Society (WHS) may be used for educational purposes as long as it is not altered in any way and proper credit is given: "Courtesy of the Worthington Historical Society, Worthington, OH." Prior written permission of the WHS is required for any other use of Sunderland Pink Lustre Tea Service. Contact WHS at info@worthingtonhistory.org to request permission. 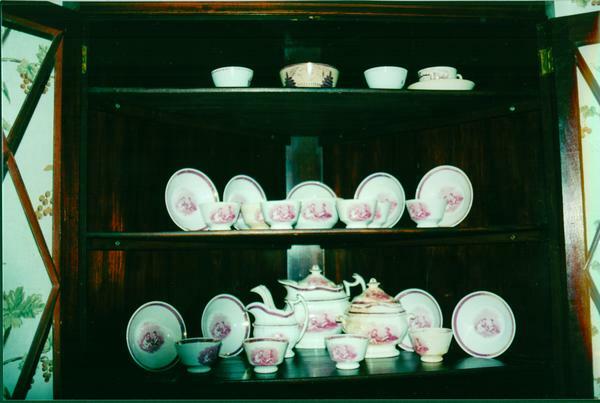 Sunderland Pink Lustre Tea Service is realia, with genre pottery. This pottery, made in Sunderland, England, belonged to Crissa Johnson Maynard. Crissa was related to Orange Johnson, one of early Worthington's prominent businessmen. The pink lustre ware tea sevice has a transfer design featuring three children. The set includes a teapot, sugar bowl with lid, creamer, cups and saucers. It is on display at the Orange Johnson House Museum, located at 956 High Street in Worthington. The Worthington Memory identification code is whs0020.